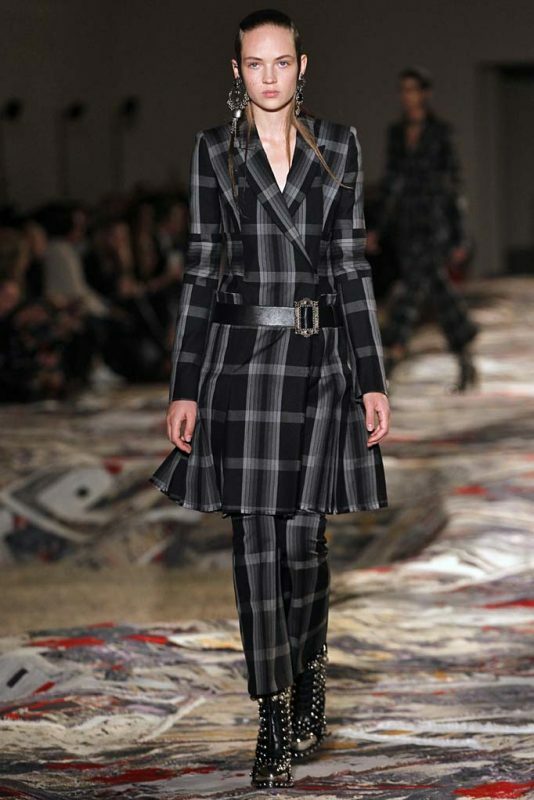 The Shetland Islands in Scotland have received Sarah Burton’s magical fantasy treatment. Her team reportedly flew to the area in the north mainland of Scotland last summer for research, and it’s clear they came back inspired. 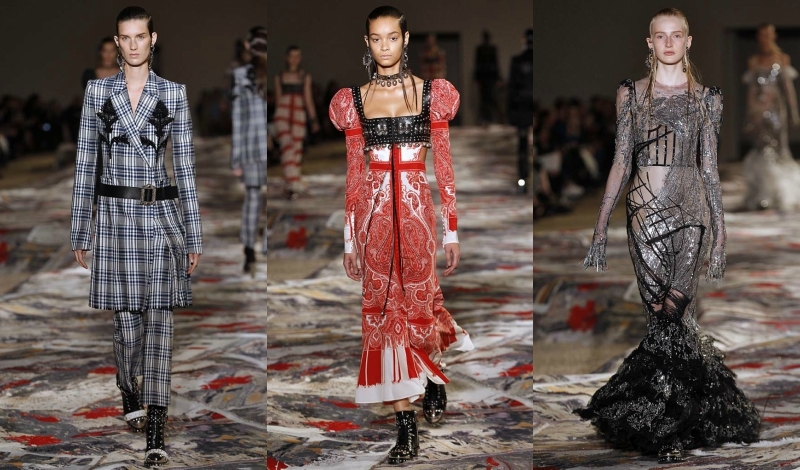 Woolen lace-knitted dresses, Medieval-looking leather cropped bodices, kilted tartan pantsuits, and frothy hemmed gowns adorned with the most exquisite and intricate beading so that they looked as though they belonged on the couture runways—Burton truly knows how to transport a woman to another realm. 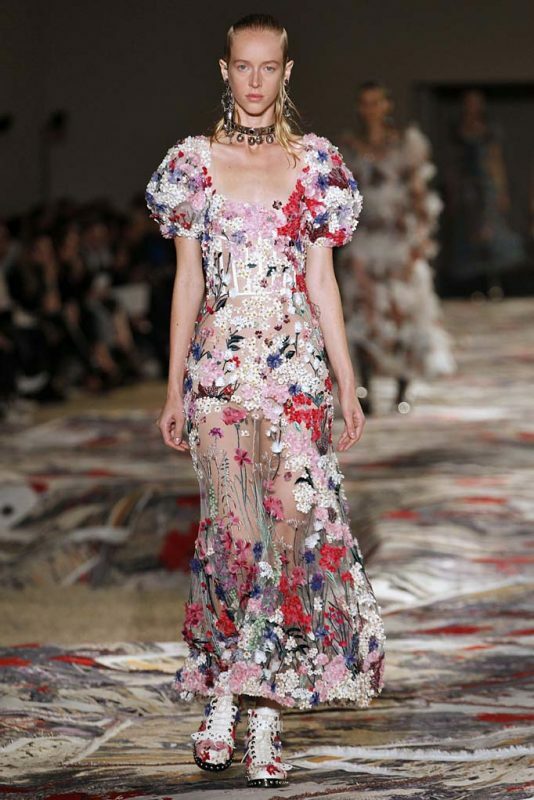 But it wouldn’t be McQueen if there wasn’t an underlying punk attitude. Those studded floral combat boots? To die for. 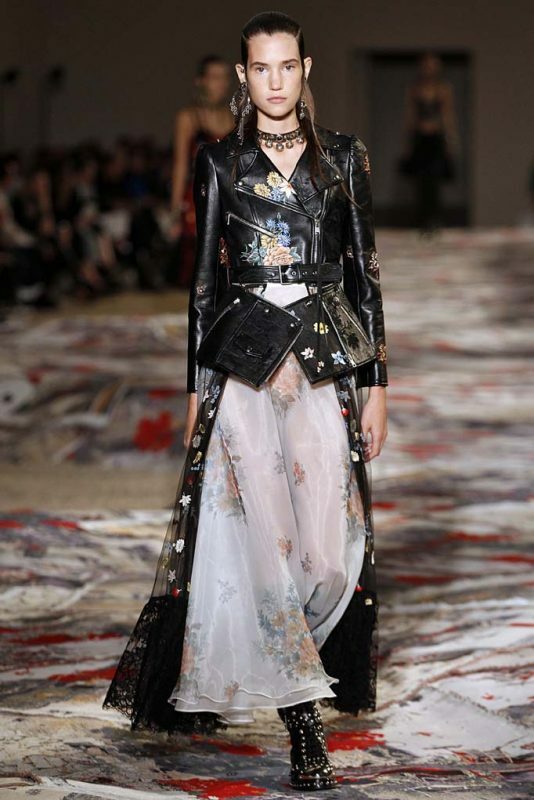 Ditto the cropped leather jackets and belts that looked like armor. If you can’t work your way into a tiny leather bustier or squeeze into a nearly see-through knit lace dress, there’s still a heap of reasons to buy into this terrifically haute collection. 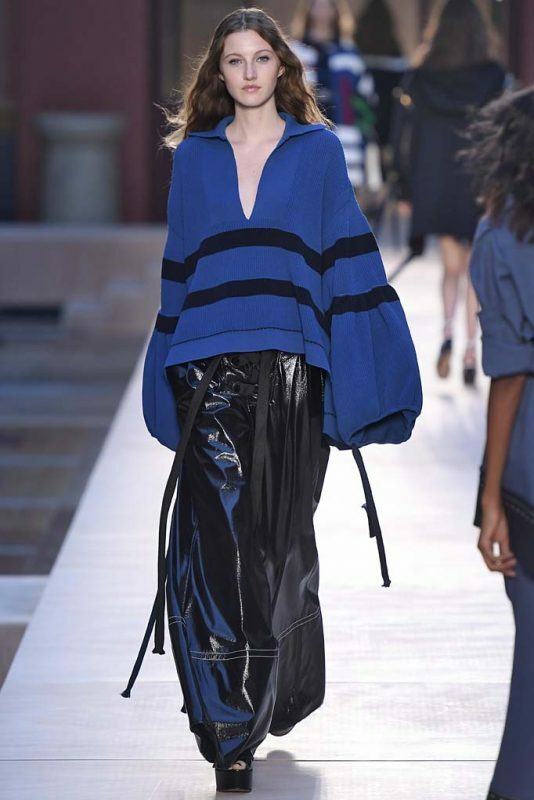 It was a bittersweet show at Sonia Rykiel this season after the famous raven-haired designer passed away at the age of 86 in August after a life very well-lived. As a tribute to the house’s founder, a screened backdrop played vintage footage of Madame Rykiel. 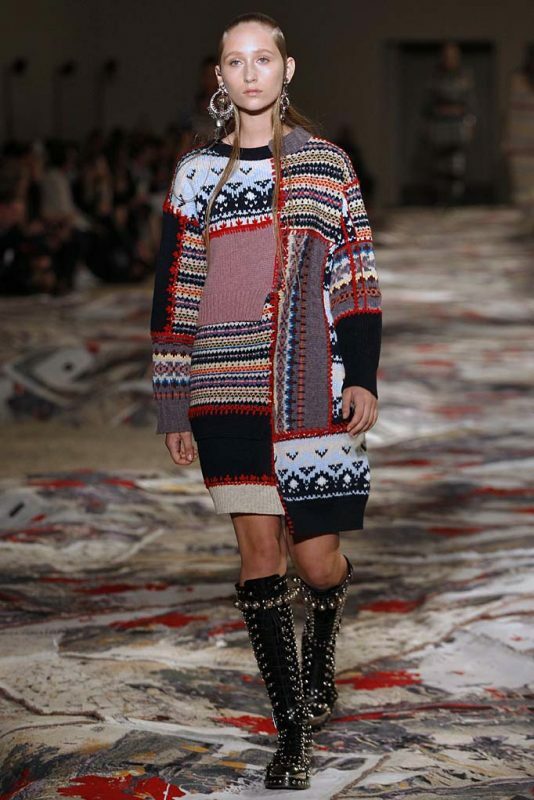 The show also honored the Queen of Knits’ now iconic sweaters. 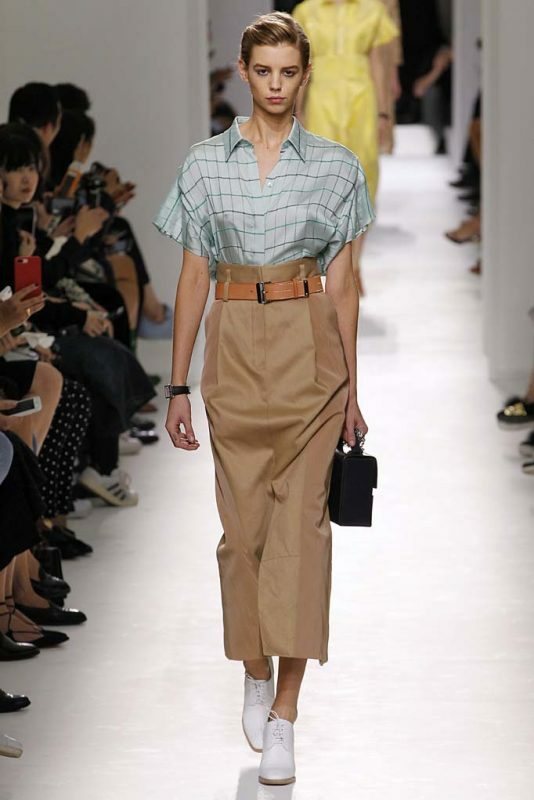 This season focused on workwear and uniforms. “I hate wasting time getting dressed,” Rykiel once said. “I like to put something on and just think: ‘Yes, That’s it.’” There were plenty of those kind of pieces in this collection, but they also made a statement, like sailor marinières, colorful striped knit dresses, oversized sleeves on knit tops, a cape with sailing flag colors, and floral pieces with unfinished hems (Rykiel was a pioneer of the unfinished hem). 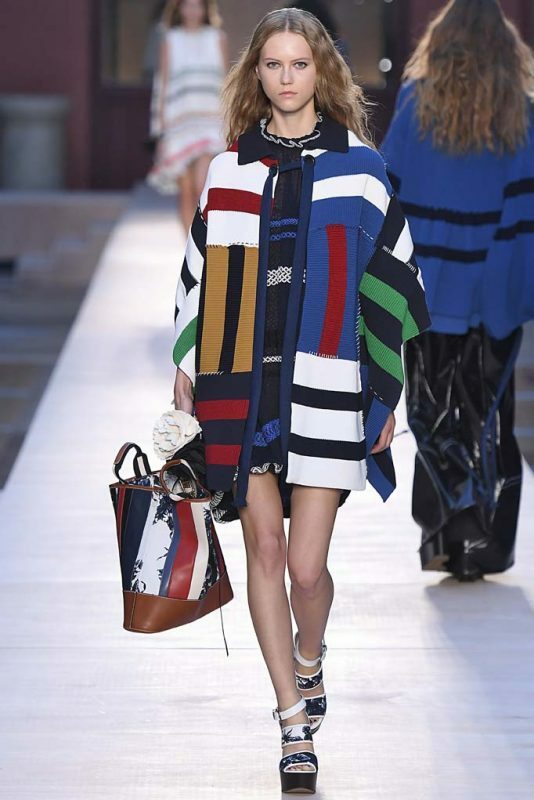 Julie de Libran is doing the Sonia Rykiel brand justice and one can imagine that Madame Rykiel would remain quite proud of how her legacy is being carried out. Riccardo Tisci held his Paris Fashion Week show at the Jardin des Plantes where editors sat outside in the chilly Parisian night air. The guests, however, kept warm with silver Mylar blankets. What was his purpose? 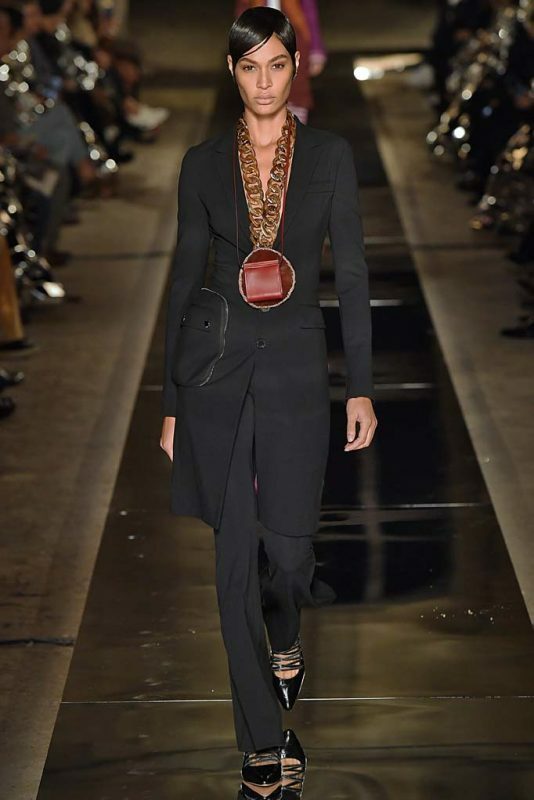 Tisci was thinking of nature, and that notion was evident in the giant geode necklaces that hung from tortoiseshell chains, and their swirling patterns were reflected in the colorful shift dresses that opened the show. 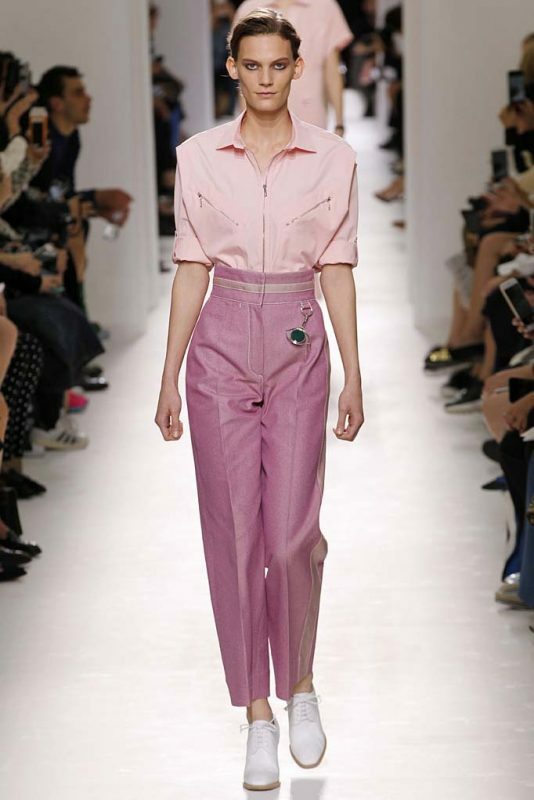 Suiting looks came with jackets that zipped off at the midriff and were accented with big hip packs, not unlike the ones seen at Marni in Milan, but here they were much less cumbersome—just enough room for your credit cards. 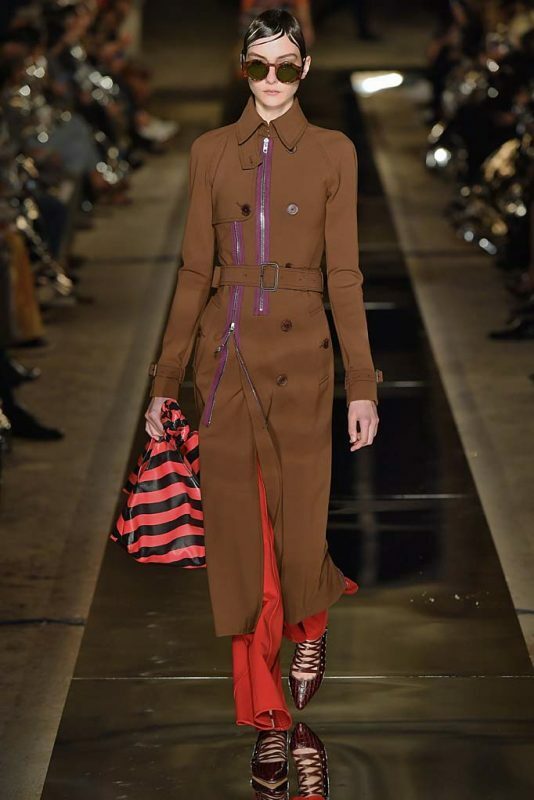 There were also dresses with prints that mimicked foliage, a lustworthy snakeskin tote, and an ultrachic earthy brown trench. Rock solid. The Hermès woman can afford to spend a great deal on well-made clothes, but she prefers to keep her riches discrete and classic. 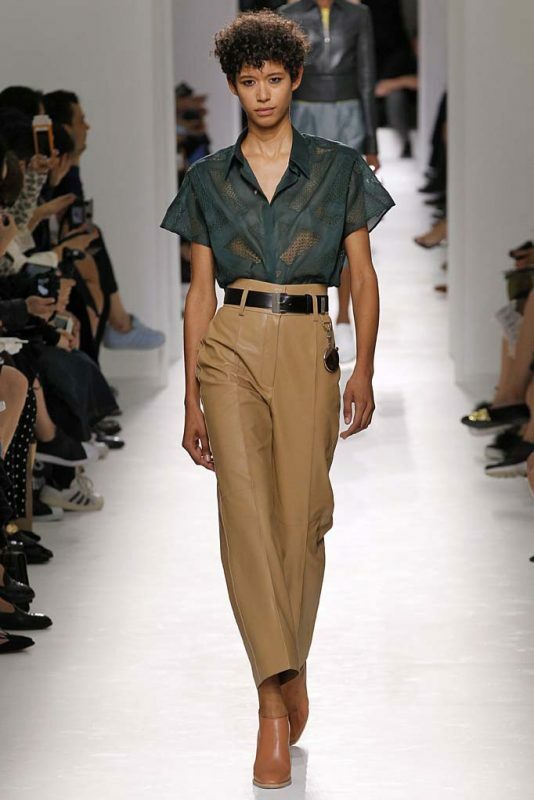 Sure, a Kelly, a Birkin, a scarf, or a bracelet from the house will say, “I’m wearing Hermès,” but you would be hard-pressed to point out a black leather coat or a pair of high-waisted leather menswear-inspired pants as Hermès on the street. No matter—this clientele is all about quality and style over fashion. 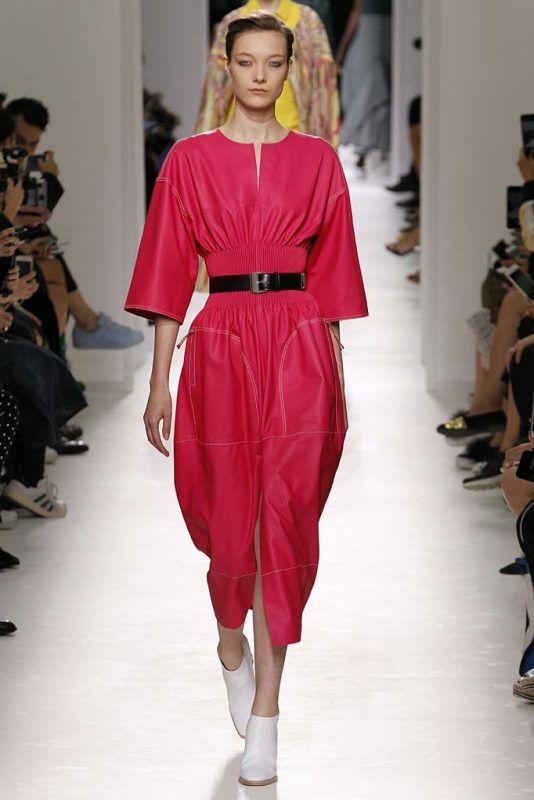 Pretty and feminine remains the name of the game for Giambattista Valli, and while the Spring collection played by those rules, it presented a new take by way of underwear as outerwear, a trend that’s proliferating the runways this season. Lacy bralettes peeked out of low-cut, floral mini dresses, or came layered on top of puffy-sleeved sweater crop tops, while some were entirely exposed beneath opened floral-printed blazers and coats. 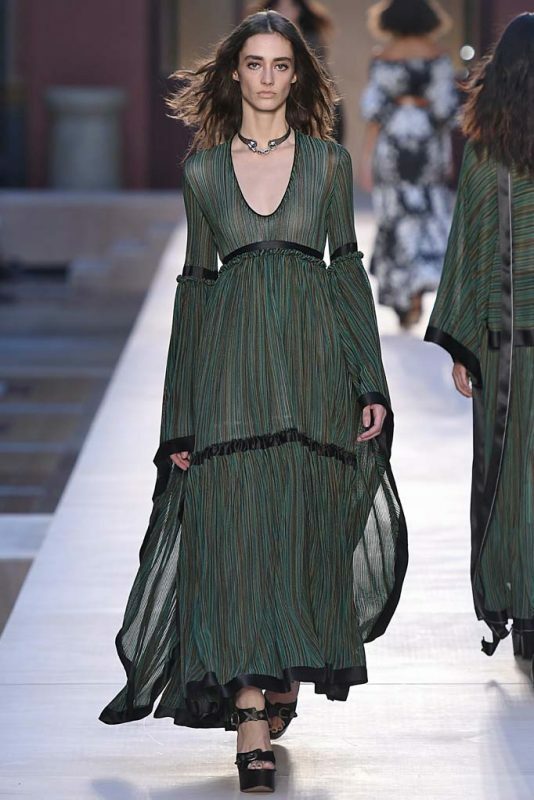 Yet, Valli still presented a variety of his feminine classics for his more conservative client: oversized sleeves and shoulders and whimsical off-the shoulder and semi-sheer gowns, a long-sleeved shift dress, a peasant blouse paired with tailored slacks. Another bit of freshness this season? 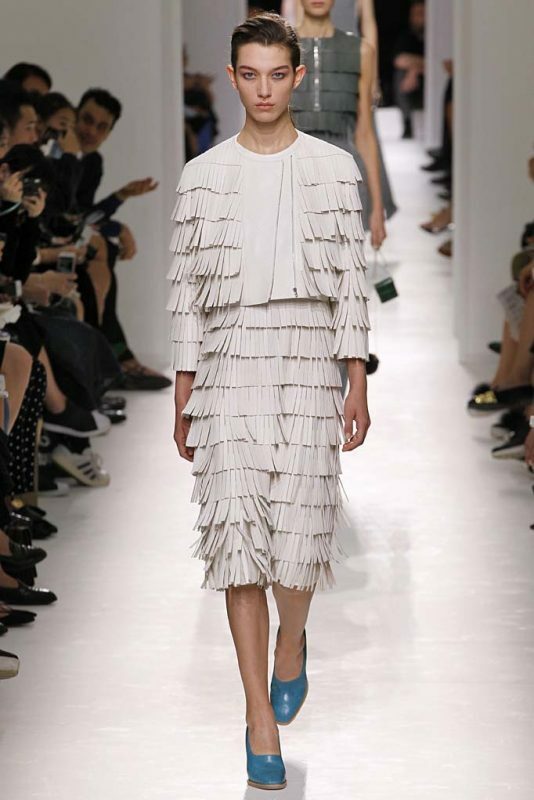 Valli’s logo cropped up on a few pieces, so subtly that at a glance, they might appear as another of his beloved florals. 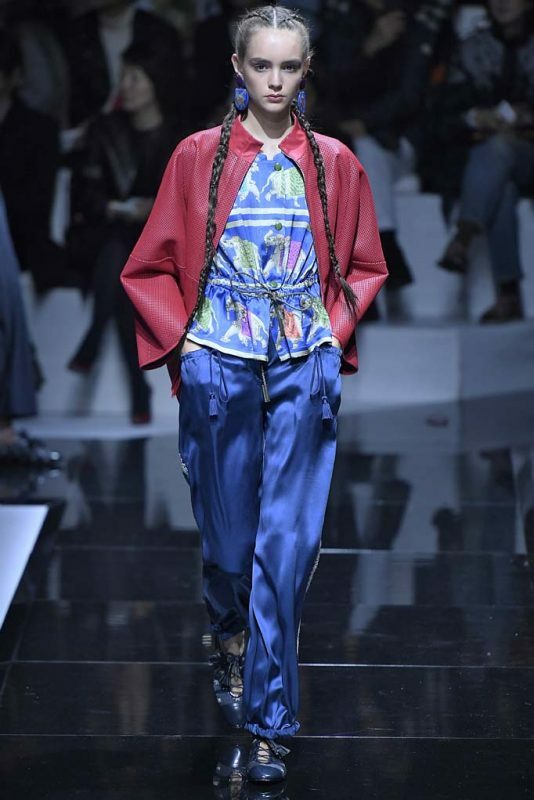 After a baffling show cancellation during Paris Fashion Week in ’98, Emporio Armani has made its return to the City of Light! 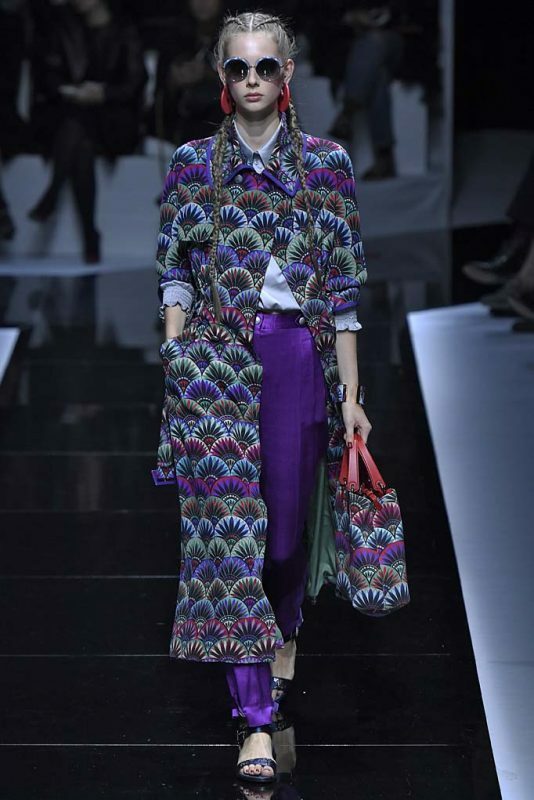 Mr. Armani first opened his Parisian Emporio Armani boutique during that year and was planning a show similar to this one when French police interrupted the affair due to security concerns. So after the renovation of the boutique this year, the designer presented a whopping 85 looks at the end of its official opening during Paris Fashion Week. 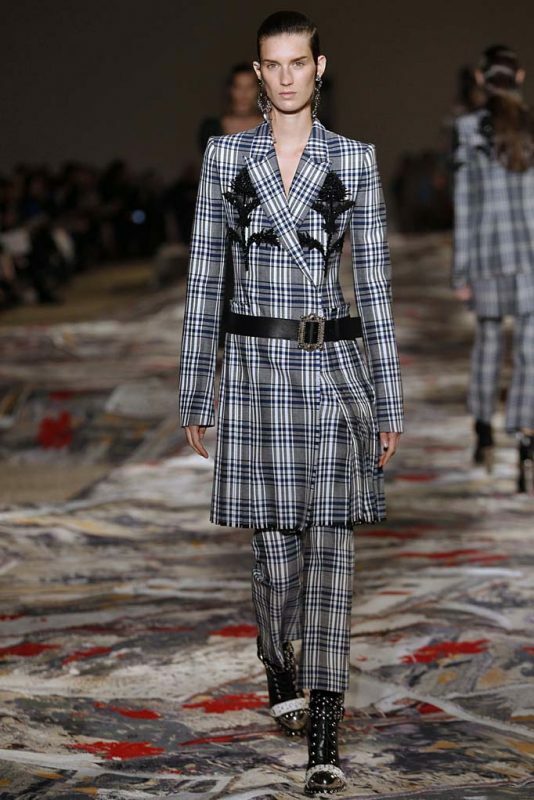 The first few he sent down the runway played off the feminine-meets-masculine dressing via tailored pantsuits, piping, and printed blazers in a medley of blues. 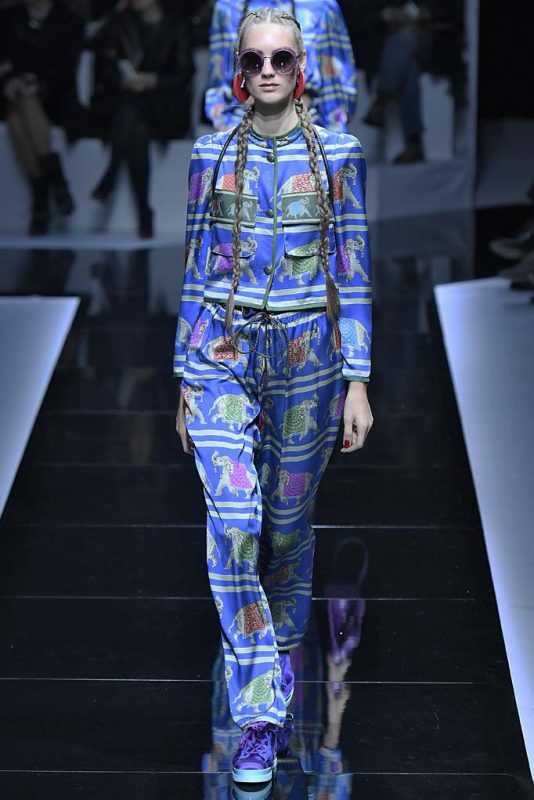 The show took on an Indian theme with elephant prints on silk tops, pajama-style silk pants, T-shirts, and breast-pockets before transitioning back into classics, like an oversized polka dot pair of light sage trousers and a white pleated mid-length skirt. 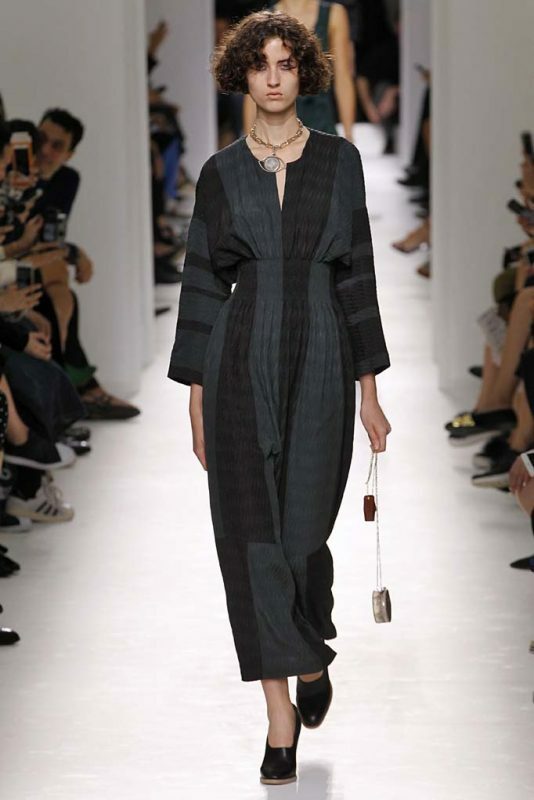 Between the silk pajama pants and the light jackets, there will be plenty to find in stores come spring.